The Launch Pad: Global Exploration Strategy: Exciting Times for International Renewed Manned Lunar Exploration! 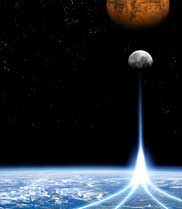 Global Exploration Strategy: Exciting Times for International Renewed Manned Lunar Exploration! It is a very exciting time for all of us that are interested in lunar exploration and manned spaceflight! It’s been a year since all the major space agencies worldwide agreed on the framework for coordination with the Global Exploration Strategy (Pdf) , a document endorsed by 14 space agencies that identifies common interests both in human and robotic exploration of several possible exploration targets and destinations in our solar system, including the Moon and Mars. We are now entering a new wave of space exploration, one of historic significance. The United States has developed its Vision for Space Exploration; the European Space Agency has its Aurora space exploration programme. 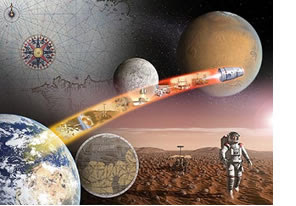 China, India, Japan and Russia have ambitious national projects to explore the Moon or Mars, while future national missions are being discussed in Canada, Germany, Italy, Republic of Korea and the United Kingdom. The space agencies' representatives who produced the document share the view that it is only through sustainable international cooperation that the enormous challenges of human exploration of the Moon and Mars can be overcome. The shared challenges of space exploration and the common motivation to answer fundamental scientific questions encourage nations of all sizes to work together in a spirit of friendship and cooperation. I really think the Global Exploration Strategy is one of the best thing that has happened is space exploration for the past 20 years! Even though international cooperation will obviously be the rule for any future space exploration program, it is nice to get everyone together and agree on a common strategy, especially when the agreed strategy is so close to the vision I personnaly embrace and share with so many others! 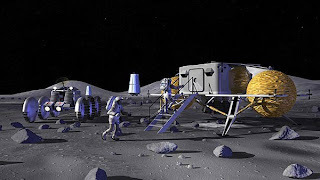 The study was intended to assess the degree to which NASA and ESA’s lunar exploration architecture concepts could complement, augment, or enhance the exploration plans of one another. [...] This is a great opportunity for the European Space Agency to prepare itself for the very important decisions that will be taken in November and that will engage Europe's role in human spaceflight and exploration for the decades to come. ESA is preparing itself to a round of decisions that will mark Europe's role in human spaceflight and exploration for the decades to come. After the satisfaction of the successful deployment of Columbus and ATV we are looking forward to enhancing our role in the partnership for a sustained and robust space exploration program where human spaceflight is the cornerstone. The Moon is surely a important case study and an useful test bed to thoroughly prepare for more distant destinations. This architecture work is very useful to prioritize our proposals to European decision-makers and define a European strategy. Human Space Exploration: Where we stand, where we are going. As both a French and European citizen, and having worked for the Aurora Exploration before, I am very pleased to see some work coming to completion and I couldn’t think of a better time to get involved in lunar exploration! The Moon will be the first place where humans learn to live on another celestial body. Just three days from Earth, the Moon has low gravity and natural resources that make it an ideal location to prepare people and machines for venturing farther into space. As a repository of four billion years of solar system history and as a place to observe the Earth and the universe, it has great scientific potential. Exploration of the Moon will also reveal whether the resources available in space will allow humans to live off the land. Although government agencies have led the creation of the Global Exploration Strategy, the Framework also recognizes that industry will have an increasingly important role in turning the new frontiers of space to economic opportunity. It is hoped that entrepreneurs will create businesses to exploit resources or provide commercial services such as cargo transport and telecommunications. Thus, space exploration will become more sustainable and government resources may be released to push further the bounds of human knowledge. An inspiring vision has been set, the foundation has been laid…Let’s do this!